14" - inside diameter 6.5"
Created with all different kinds of beautiful sea treasures, my Seashell Driftwood Wreath is a stunning display of beachy paradise! The wreath itself is gorgeous – it is made with pieces of driftwood. 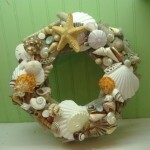 I used large white starfish, sea urchins, scallop shells, turbos, and many other different kinds of shells. 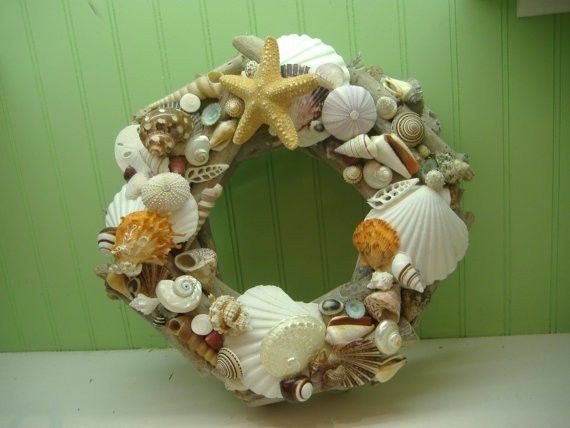 What makes this wreath so special is the amazing color, all created by the natural beauty of the shells! The diameter of the wreath is 14 inches with an inside diameter of 6.5 inches. It comes with a jute loop tied onto the back for easy hanging. This wreath has a wonderful natural feel! You can hang it on a wall, on your door, or it also looks great as a centerpiece with a tall candle in the middle.